Cognitive radio and spectrum management continue to drive innovation among military communication system designers to enable more capability and faster decision making for warfighters. Efficient spectrum management is becoming especially important as the spectrum gets more crowded and as the U.S.Department of Defense is considering naming the spectrum as another warfare domain like cyber. In this podcast with Manuel Uhm, Director of Marketing, Ettus Research, a National Instruments company and Chief Marketing Officer of the the Wireless Innovation Forum (formerly the SDR Forum), he discusses the challenges in developing cognitive radio and efficient spectrum management, potential solutions and the efforts the Wireless Innovation Forum is making to see these technologies become reality for warfighters on the battlefield and everyday consumers. This podcast is sponsored by Pentek. 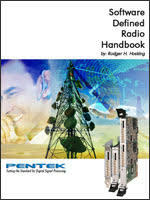 For more information download the 13th edition of Pentek’s software defined radio handbook, a technical reference to SDR.